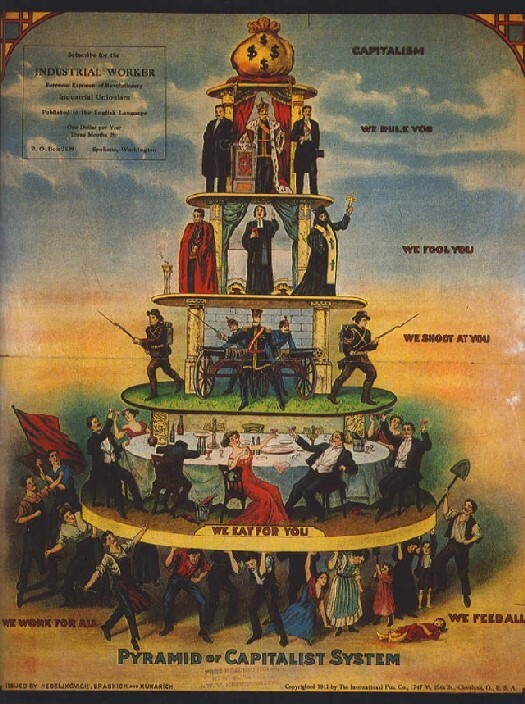 Above is the historic 1911 illustration showing an Edwardian socialist’s view of capitalism. - To educate the political class and the general public about the reality of “climate change” – that it is driven by the sun and other astronomical influences and NOT man made emissions of gases such as CO2. - To expose the trade in carbon credits and the whole new capitalist money making agenda as the monstrous scam it is. - To encourage those most vulnerable to the sky high fuel bills coming down the tracks – i.e. the poor and the elderly, and those who seek to represent them – to learn the facts about “climate change” and to protest and to organise to end this scam. This strategy is clearly from the left. If you think about it, the left political flank is the direction from which to concentrate the attack on the greenies because it is the poor and the elderly who are going to be hardest hit by the effects of the trade in carbon credits and the low carbon economy. This is because the effects of the low carbon economy desired by such “socialists” as Mr. Ed Miliband, Labour’s new leader will include the mass transfer of carbon intensive industries such as steel making and aluminium smelting to third world countries and thus accelerating the trend whereby employment in Britain is largely service industries. The reason for the poor attendance at yesterday’s meeting was obvious. The meeting had not been organised in time to have its details included in the conference magazine, thus the organisers could only publicise their meeting by handing out flyers. For those British Gazette readers who are not political anoraks and members of a political party, a word of explanation is required here: Attendees of political conferences are a “rare breed” when viewed against the population of the U.K. as a whole. These are people who choose to spend a week of their holiday allowance granted by their employer in a city such as Manchester at the end of September – choosing to eschew more obvious vacation spots such as the Costa del Sol. Not for these aficionados the visit to a museum or art gallery. No, they prefer to spend their days listening to politicians making speeches and outside the conference hall and in the evening listening to politicians making more speeches. For this rare breed – the political animal – “the fringe” (meetings held outside the main political events) are a major reason for attending a political party conference. The conference magazine is a publication eagerly awaited and well read by those planning to attend the conference. NB: this applies for every political party, large or small. Next year, hopefully, the Campaign Against Carbon Capitalism will be able to organise earlier enabling it to appear in the conference magazines of the three main political parties: the Conservatives, Labour and the Liberal-Democrats.